Copings, Parapets, and Tops of Walls. Masonry parapets require special attention during design and construction since they will be exposed to weather on both faces as well as on their tops. 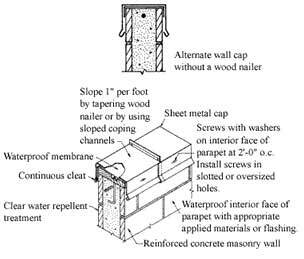 Sheet metal caps can effectively resist water penetration through the tops of the parapets if the metal covers the entire top and extends at least two inches down over both faces of the masonry (see Figure 3). Three inch extensions are preferred to allow for tolerances, and should be considered the minimum extension for split face and scored units. Four inch sheet metal cap extensions are preferred for fluted units to avoid winddriven rain being blown under the cap. Refer to the Sheet Metal and Air Conditioning Contractors' National Association (SMACNA) literature for proper design of sheet metal, including laps and weathertight installation. Note that the recommendation is to extend the sheet metal cap two to four inches over the face of the unit, not to have only two inch to four inch legs on the metal cap. Where wood nailers are used and where the cap flashing is sloped to drain the water from the metal cap, the extension needs to be increased by the dimension of the nailer. Extensions of the roofing cap sheets over the top of masonry parapets are not recommended. Roofing contractors tend to end the cap sheet several inches from the face of the masonry unit to prevent staining from the bituminous materials. This leaves several inches of the top of the masonry wall exposed. In addition, cap sheets tend to fishmouth due to expansion and contraction, allowing water to enter beneath the cap sheet. Sheet metal caps are therefore preferred. If mortar caps are placed on top of parapets, they should be amply sloped so water will drain freely. They should also be painted with an elastomeric coating since mortar caps are prone to cracking. Similarly concrete masonry, precast concrete and stone copings should also be painted with an elastomeric coating due to the joints between the units. Roof Flashing Connections to Concrete Masonry Walls. 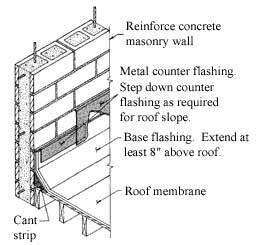 Counter flashing and base flashing are vital in resisting water penetration between roof structures and concrete masonry walls (see Figure 4). Consideration should be given so the wall strength is not adversely affected by extending the flashing too deeply into the mortar joints.